WHY RENT YOUR FILLER WHEN YOU COULD OWN IT? Bellafill®, proven to be safe in the longest and largest dermal filler study ever completed, it offers a new level of filler rejuvenation. The collagen gel immediately adds volume, while the unique PMMA (polymethylmethacrylate) microspheres will help your skin re-create it’s own firmer structure. Over time, the collagen gel is absorbed by the body. The PMMA microspheres remain in place and create a matrix that will support the production of the body’s own collagen for a long, lasting correction. Repeated facial movements such as frowning or squinting, will create lines. Age, gravity, and weight loss will cause volume loss. Bellafill® effectively addresses the volume loss to reverse the signs of aging instantly and with longevity. 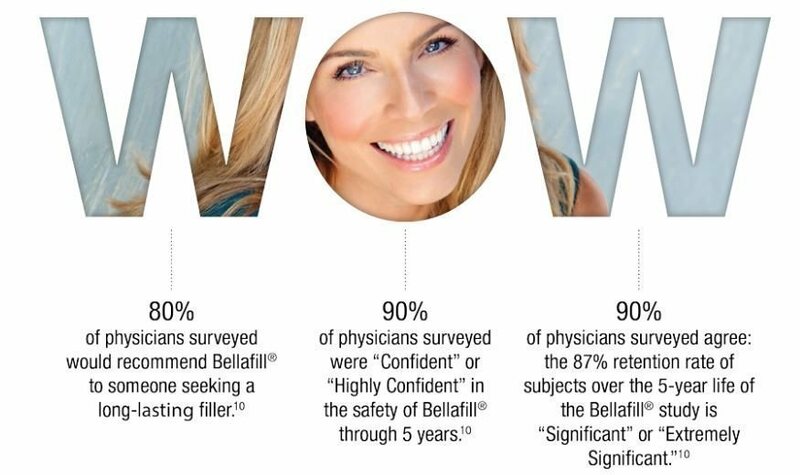 With the beautiful benefits of Bellafill®, beauty does not always mean it has to be painful. With a comfortable 0.3 % Lidocaine injection, and little to no downtime, you can immediately resume to normal daily activities. The entire world of aesthetics is moving toward longevity. No one is looking to be in a medical practice getting injectable fillers every 6 months or even every year. With a small pre-treatment skin test, you too can have the longevity you have been waiting for.